Halley's Comet passed perihelion in its twenty-third known passage, as determined from records by Chinese astronomers. Galileo Galilei (15 February 1564 - 8 January 1642), was a Tuscan astronomer, philosopher, and physicist who is closely associated with the scientific revolution. His achievements include improving the telescope, a variety of astronomical observations (including discovery of Jupiter's largest moons), the first law of motion, and supporting Copernicanism effectively. He has been referred to as the "father of modern astronomy", as the "father of modern physics", and as the "father of science." His experimental work is widely considered complementary to the writings of Francis Bacon in establishing the modern scientific method. Galileo's career coincided with that of Johannes Kepler. His work is considered to be a significant break from that of Aristotle, and his conflict with the Roman Catholic Church is taken as a major early example of the conflict of religion and freedom of thought, particularly with science, in Western society. Comet C/1760 A1 (Great comet) approached within 0.0682 AUs of Earth (approx. 6.34 million miles), the seventeenth closest in recorded history. Jean Foucault demonstrated definitively that the Earth rotates on its axis. Herman Hollerith received U.S. Patent 395,782 for his electric tabulating machine, the tabulator, the first device for data processing; his firm later became one of IBM's founding companies. A. Charlois discovered asteroids #379 Huenna and #380 Fiducia. P. Gotz discovered asteroids #554 Peraga and #556 Phyllis. J. H. Metcalf discovered asteroid #660 Crescentia. K. Reinmuth discovered asteroid #1152 Pawona. H. L. Giclas discovered asteroid #3177. A. C. Hardy patented the spectrophotometer, an instrument to measure a light beam's intensity as a function of its color (wavelength). K. Reinmuth discovered asteroid #1409 Isko, #1410 Margret and #1411 Brauna. M. Laugier discovered asteroid #2068 Dangreen. S. Arend discovered asteroid #1717 Arlon. H. Potter and A. Lokalov discovered asteroid #2975. 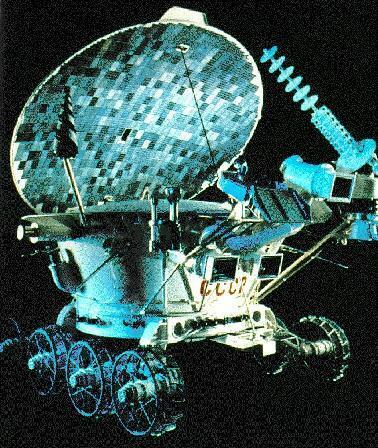 USSR launched Luna 21 carrying the Lunokhod 2 rover, the second robotic Lunar rover. L. Kohoutek discovered asteroid #2375. A. Mrkos discovered asteroid #2367 Praha. E. Bowell discovered asteroids #3277 Aaronson, #3759 and #3760; and J. Wagner discovered asteroids #3045 Alois, #3512, #3562 and #3589. Japan launched the Sakigake mission to Comet Halley. USSR launched the manned spacecraft Soyuz TM-18 into orbit for the 18th expedition to Mir, carrying a crew of three (Viktor Afanasyev, Yury Usachov, Valeri Polyakov). Cosmologists announced that the rate of expansion of the universe is increasing.